Note that, I have been using Heroine Make for about a year now, and so this photo does not do it justice. Side by Side photo, physically the same size. - Waterproof, Eye-drop proof, Oil/grease proof, but can be washed off with warm water. - very thin but did not specify how thin. I am always on a look out for liquid eyeliners because my eyelids tends to grease up as the day progresses and because I have single eyelids (not double eyelids) pencil eyeliners smudges. 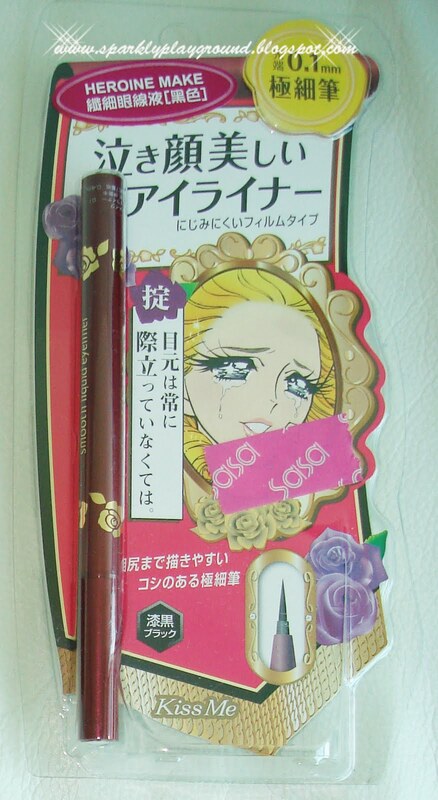 I bought Heorine Make Kiss Me Liquid Eyeliner last year at Sasa. I was sold by the packaging because of the crying anime girl and I assumed it had good lasting power. Luckily, I was right. It lasted throughout the day despite of the humid weathers of Hong Kong. The product was always flowing with color and has a very smooth application. I never need to go over it and the color does not fade. It dried instantly but didn't over dry my lids either. Then this summer, I figure I should replace my liquid eyeliner because of hygiene reasons. Heroine Make eyeliner works perfectly fine till this day but I wanted to try something new. Since the hype for Dolly Wink is huge and the packaging IS nice, I wanted one too (like a little girl wanting what everyone else has) I'm happy that the tip is as fine as my Heroine Make liquid eyeliner. It is smooth also. But I find that this dries slower than Heroine Make. Due to exams, I have been taking naps whenever I can to catch up on sleep. I slept with my eyeliner on since it said its waterproof and sweat-proof. I always did this with my Heroine Make eyeliner and I look perfectly fine when I wake up. But Dolly Wink was smudged and faded and basically gone. So, it's not grease-proof like Heroine Make. I'm quite upset, because this is a huge personal problem that I have. My lids get greasy =(( And the product cannot preform good on me. Maybe this won't bother others but it does to me. Heroine Make is better due to the price and its performance. Dolly Wink has cute packaging but did not preform up to my expectations. and it is pricy. Does anyone have greasy eyelids like me or encountered the same problem?